The book on guarding Giannis Antetokounmpo is evolving. When the Milwaukee Bucks faced the Utah Jazz's elite defense earlier this month, head coach Quin Snyder's plan was to give Antetokounmpo a sizeable cushion on the perimeter to prevent him from driving. As soon as he elected to shoot, though, his defender would close out hard to contest rather than daring him to launch. When Antetokounmpo splashed in a 3 to quiet the Vivint Smart Home Arena crowd, one scout leaned back in his chair and put his hands on the back of his head. "When he can shoot that consistently," the scout said, "he will be unguardable." At 24, Antetokounmpo has already been the league's Most Improved Player and an All-Star captain, and he is currently a strong MVP candidate. Incredibly, he's become one of the most popular and dominant NBA players during the golden age of the 3-pointer without a reliable outside shot. 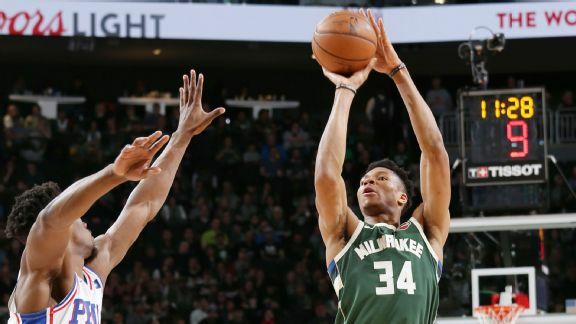 His progress as a shooter this season, with coach Mike Budenholzer's careful guidance and endless encouragement, suggests that Antetokounmpo's basketball takeover is just getting started. "He has the 100 percent green light to shoot," Budenholzer said. Entering March, Antetokounmpo had improved his 3-point percentage each month this season, reaching 40 percent in February. He's also made noticeable progress on pull-up 3-pointers, a key weapon for a lead ball handler. In 2018, Antetokounmpo shot just 5.6 percent on pull-up 3s, which ranked last of the 76 players who attempted at least 15 such shots. Since Jan. 1, he is shooting 36.8 percent (7-of-19) on pull-up 3s. He still can't be described as a good 3-point shooter, but a player with so many other skills needs only to be a confident and competent one. "I am really confident the ball is going in," Antetokounmpo said recently. "Obviously, it looks good when the ball goes in. You feel a lot better about yourself. At the end of the day, I have been working on it. "As I've said in the past, my teammates, the coaching staff want me to shoot the ball. I want to keep shooting the ball." Though Antetokounmpo has been making adjustments to his shot since his rookie season, his focus on 3-point shooting was heightened during the summer of 2018. The Bucks underwent a coaching change, and with that, a philosophical change on how Antetokounmpo should be used offensively. Former Bucks coach Jason Kidd was much more careful in his treatment of Antetokounmpo's shooting, especially early in Antetokounmpo's career. During his second season, just 6 percent of his shots were 3-pointers. This year, that number is up to 15 percent. That increase is no accident: Budenholzer has reiterated that no matter how many times Antetokounmpo's 3-point attempts ricochet off the backboard or fall short of the net altogether, he should keep shooting from distance. And it's not just Antetokounmpo. Budenholzer has transformed the Bucks, who were 27th in 3-pointers made per game last season and are second this season. "You go into any game and figure out what sword you're going to die on," Philadelphia 76ers coach Brett Brown said Sunday, before Antetokounmpo exploded for a career-high 52 points and connected on three of a career-high eight 3-point attempts. "You have to pick your tolerance level. There are times when you're trying to absorb his drives where you're not going to be able to get outside to guard the 3-point shot. Budenholzer's philosophical approach to Antetokounmpo's shooting stems from his belief in the power of spacing. Bucks assistant and shooting coach Ben Sullivan recently diagrammed the vision on a whiteboard: Antetekounmpo, with four shooters around him, drawing enough attention away from the paint when he approaches the perimeter to create wide open cutting and driving lanes for his teammates. "We need to give Giannis space and we have been trying to execute that vision ever since. We just keep trying to tweak it and make it better and different and harder to guard." Together, Sullivan and Antetokounmpo have spent hours in the gym nipping and tucking Antetokounmpo's shot. The Bucks call their personalized exercises "vitamins" because they "take them daily." Antetokounmpo's vitamins include a heavy dosage of shooting. Though Antetokounmpo is routine-oriented, Sullivan will mix in various creative exercises to break up the monotony of standing at the top of the key and putting up shot after shot. Sometimes, Sullivan will roll an office chair out onto the court for Antetokounmpo to sit on while shooting. Other times, Sullivan will instruct his pupil to shoot into the eyes of the Bucks logo mounted on the wall 20 feet above the ground. Antetokounmpo has been improving throughout the season. "He is already one of the top players in the NBA," Sullivan said. "Working on shooting and improving on shooting is only going to help further enhance that. What's the narrative you hear? 'If Giannis could shoot, he would be unstoppable. Unguardable.' He is already unguardable. If he could shoot, he would be even more unguardable." Antetokounmpo still has real work to do to become a consistent outside threat. Though he is launching more 3s than he has in his entire career, he is still shooting just 25 percent this season on a relatively small number of attempts. But Antetokounmpo and the Bucks are less focused on the black-and-white efficiency number than his long-term growth in comfort and confidence. "Hopefully, when we get in the playoffs and when it matters the most, I will be able to knock some shots down," Antetokounmpo said. Developing consistency from distance in time for the playoffs may be an overly ambitious goal for Antetokounmpo, who is the league's most dominant presence in the paint. Opponents would rather test his shooting range with the season on the line than see him drive the lane. But when that 3-point shot becomes a reliable weapon, the old manual on how to guard Antetokounmpo will be outdated, no longer useful for defenses trying to guard the unguardable.